Here's hoping that keeping an organized kitchen will make food magically cook itself. 1. A bamboo cutting board that comes with a set of colorful plastic boards – you might throw your inferior cutting board out the window. Set includes: 16.5"x13.4" bamboo chopping block and seven brightly color-coded cutting board mats. Mats are BPA-free and not dishwasher safe. 2. A beauteous magnetic knife holder to get all your knives off the counter, and readily available on the wall. 3. A copper hanging fruit basket so fruit can grow up, and move into their own place. It's time to stop mooching on the v overwhelmed counter 🥝 🍒. 4. A sous vide cooker for anyone who wants a more organized kitchen so cooking is easier – you can now cook from your phone. Farewell clunky slow cooker, hello more counter space. This sous vide cooker heats and circulates water in the pot, evenly cooking food to a precise temperature for perfect results every time. It connects to Bluetooth so you can start, stop, and monitor your cook from your phone. 5. 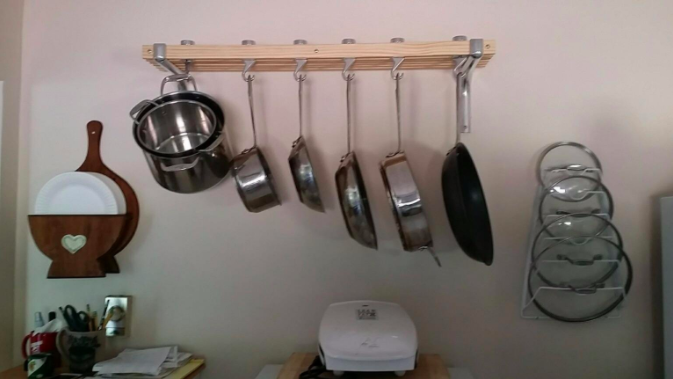 A heavy duty pot rack I own and swear by, as will you. Who knew getting my pots off the stove and onto this rack would bring such joy into my life. Get it from Amazon for $52.80. 6. 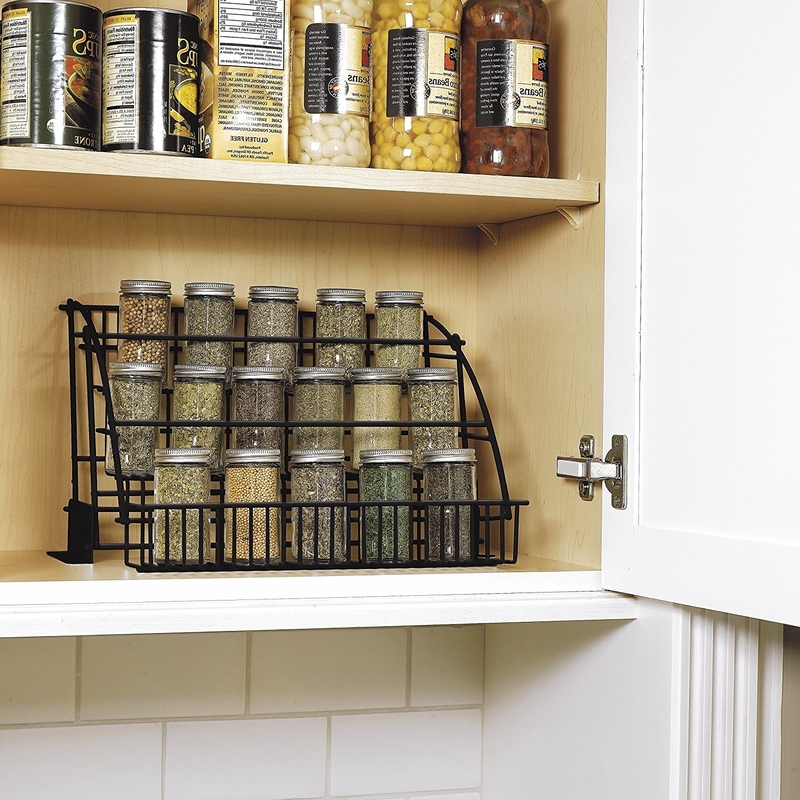 A behind-the-door cabinet for taking your kitchen storage capacity to the highest, most clever level. Just looking at this and picturing it in my small AF kitchen makes me weep. Get it from Amazon for $126.50. 7. 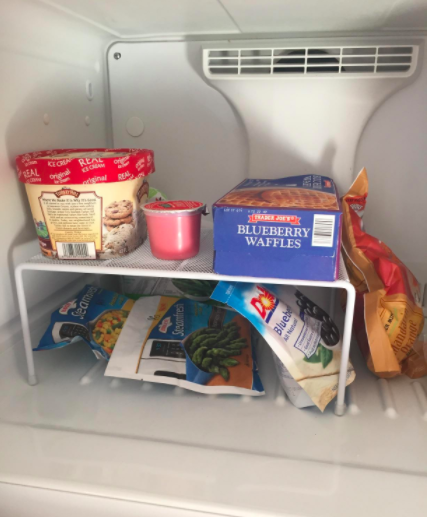 And a stackable, expandable shelf so you can ensure you're getting the most out of the cabinets (or freezer) you already have. 8. An expandable bamboo drawer organizer that transformed my life when I inserted it into the one and only drawer in my kitchen. This is the gift your kitchen needs to receive. 9. A set of glass nesting bowls worthy of freezing, heating, and preserving all the delish food. Surprise, I also own these, and stacking them into each other when I am not using them rules. Set incudes: one of each 2-cup, 4-cup, and 7-cup bowls with white lids. Made of nonporous glass that won't warp, stain, or absorb odors. Glass is preheated oven, microwave, fridge, freezer and dishwasher safe. Promising review: "The thing that makes these glass containers stand out is the silicone lid. I love these. The Pyrex glass is tough and durable – I use these to pack my lunch daily, so they've gotten their fair share of being banged up while en route to work; and they are still going strong. Well worth the money. I'll be investing in more containers like these." –Laurie P.
10. 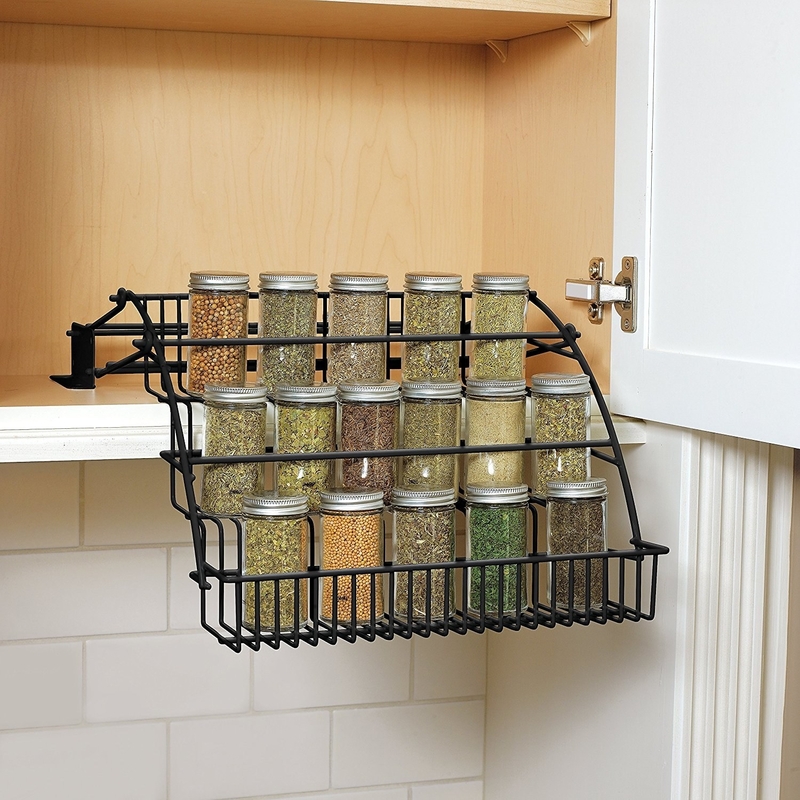 An drop-down spice rack for impressing every person who comes over for a home-cooked meal. Get it from Amazon for $17.61 (available in three finishes). 11. A 6-tier shelf unit just waiting to lead Operation Get Your Kitchen in Order 2018. 12. A tea bag organizer that'll make tea time the most precious and accessible time of the day. Promising review: "Do I really need a tea bag organizer? That's what I was thinking when I ordered this. And when I took it out of the box. And when I filled the first little bag holder. But as the pile of empty boxes grew larger, I knew the answer was yes – I do need a tea bag organizer. I was using a whole shelf, and a half of jumbled tea boxes, which I had to sift through to look for a specific tea. In the end, I think this held about eight or nine boxes of tea bags (I crammed some of them). I am so happy that I got this!" –Sarah C.
13. 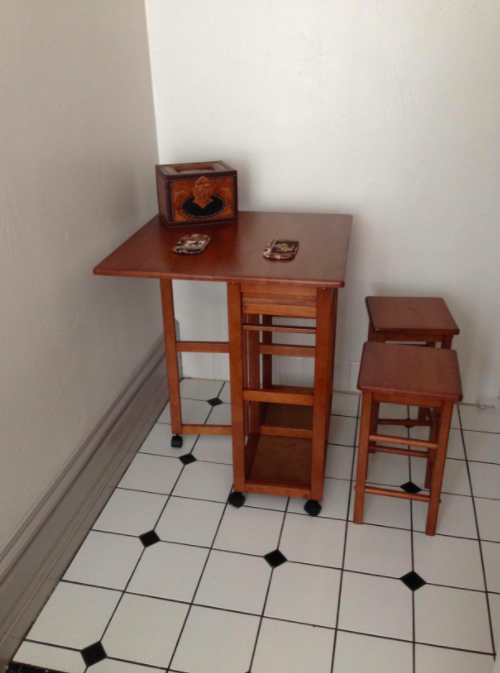 A versatile wood table and stool set worthy of apartment living. This table makes me want to set the table in my kitchen on fire, for not being this table. Get it from Amazon for $124.95+ (available in two colors, shapes). 14. A double dry food dispenser so eating cereal or feeding your pets becomes the easiest thing you do in the New Year. Get it from Wayfair for $22.86. 15. A handy dish rack you can fold up when you're done with it. If only the same could be said for 2017. 16. 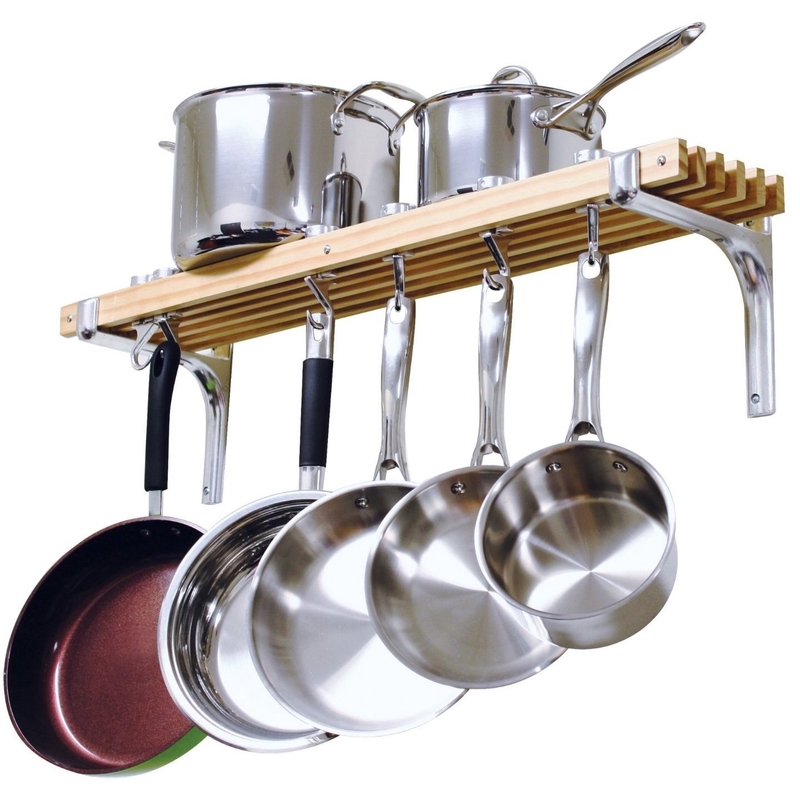 An over-the-cabniet cutting board holder invented by some genius, to be enjoyed by lovers of organization far and wide. Get it from Wayfair for $18.47 (available in two finishes). 17. A K-Cup holder for anyone who has way too much coffee, and only plans on increasing the collection. 18. A customizable under-the-sink shelf so the under-the-sink mess shall finally meet its end. 19. A storage bag holder worthy of taking us all into the beautiful beautiful future. This is basically the invention of the wheel, take two. Get it from Amazon for $5.90+ (available in 2, 4, and 6-packs). 20. A paper towel holder that'll continue the "get it off the counter and onto the wall" kitchen storage philosophy. Get it from Wayfair for $14.99. 21. A sturdy sink caddy you shall need in your life, because your sponges deserve better than collecting grime in the sink/on the counter. 22. An adorable utensil holder so your utensils won't be *owl* alone. Get it from Amazon for $15.49+ (available in two colors). 23. 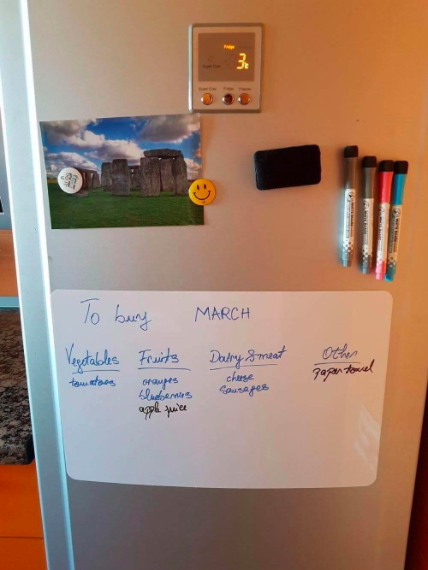 A magnet white board sheet for anyone who wants to transform the fridge into organizational heaven. 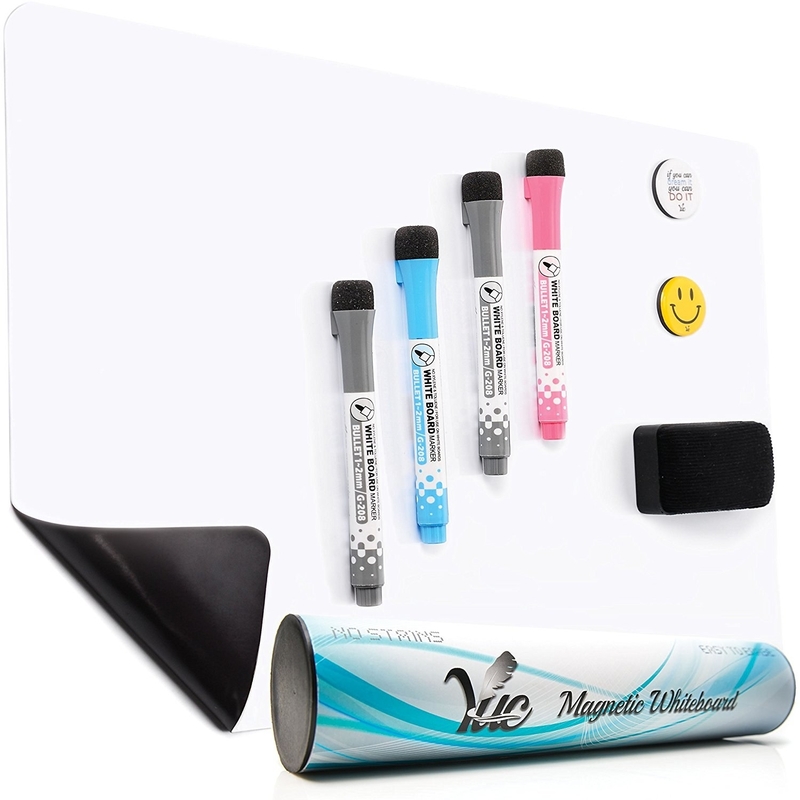 Set includes: magnetic white board, four markers, large eraser, and two small fridge magnets. 24. A 10-piece set of clear storage containers that'll make finding your favorite snacks an easy peasy process. Set includes: two tall containers (2.0 qt/2.3 liters), two medium containers (1.5 qt./ 1.7 liters), four small Containers (0.9qt/1.0 liter), and two mini containers (0.35qt/ 0.38 liter). Promising review: "Love this set! It's pretty enough to set on my countertops, and keeps my frequently used food items close at hand. The ULTIMATE test: After finding no product out there to keep my brown sugar from clumping and hardening, I put it in one of the medium containers – it is soft and fresh! I highly recommend these canisters – pretty, practical, and they work. A+. –Kristen B. Get them from Amazon for $66.97. 25. 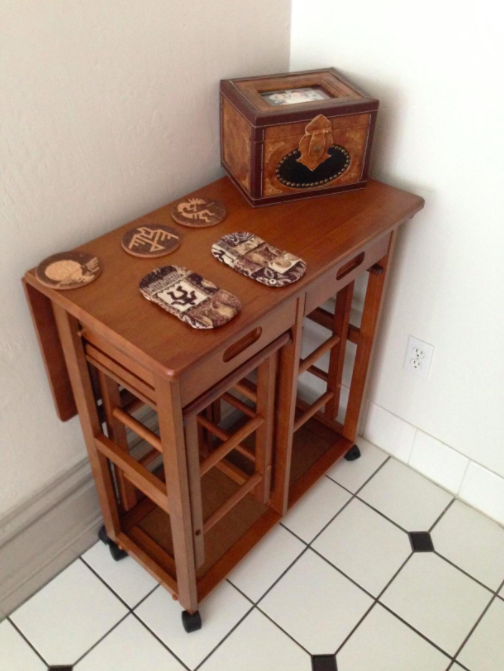 A moveable kitchen cart as gorgeous as it is practical, and just may bring you and your neighbors together. Get it from Wayfair for $155.99 (available in two colors). 26. 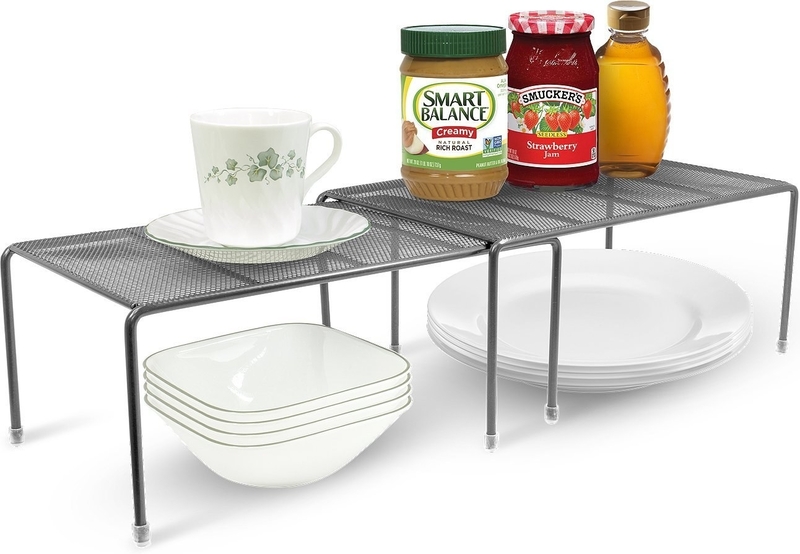 A shelf basket to ensure you truly are using every inch of space your kitchen has to offer. 27. A mug tree so you can give six mugs a brand new home, and free up some cabinet space. 28. And a set of 12 handmade magnets that'll make your fridge the center of attention, while ~holding it all together~. Get them from The Indoor Garden Shop on Etsy for $12. TFW the kitchen is organized and nothing can stop you.